I appreciate your transparency. A writer who doesn’t struggle with what they write is not a writer I was to read. The photo at the top is so appropriate! 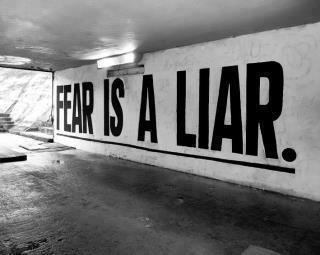 Fear is a liar and pushes us to take action based on that lie. But we have the Truth. You brought that out beautifully. I think of the Declaration of Independance. “We hold these truths…” Psalm 27 is a great Truth to hold in times of fear. We will need to deal with fear as long as we’re here. But we have a book filled with Truths to get us through.